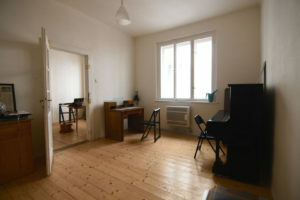 The NEIRO studio and residency space is situated in the peaceful neighborhood Vršovice, just a short walk from Vršovické náměstí. A calm place hidden in one of the courtyards inspires and encourages music, visual, or literal creation. This inspiring artistic neighborhood has begun to transform into a base for many Prague based creators, not only due to its charm, but also accessibility. The space is divided into two sectors – residential and studio. The first part has a kitchen, dining table, and a second room with a piano, bed, and a library. The studio has 40m², concrete floor and the windows are situated into the courtyard. The bathroom is in a corridor between the two sectors. It is also possible to work in the courtyard during warm summer months.